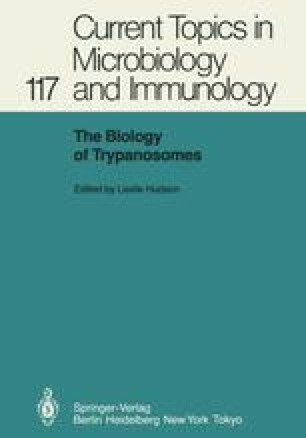 The cell surface membrane of Trypanosoma cruzi must possess a number of properties in addition to those such as nutrient transport and ion balance maintenance normally associated with cell surface membranes. These extra properties will include the presence of receptors for binding and penetration of host cells, the ability to survive in the hostile environment of the insect vector’s intestinal tract and resistance to the host’s immune system. T. cruzi has a complex life cycle (Brener 1973) and the requirements of and influences upon each morphological stage are different; it is probable that these environmental and life style differences will be reflected in surface membrane properties of the cells. A number of experimental procedures have indeed shown that there are changes in surface membrane properties between stages; for example, charge differences have been detected by cationic ferritin binding (De Souza et al. 1977), differential binding of a series of lectins has been found for each stage (Pereira et al. 1980), cell surface protein and antigenic differences have been found (Snary etal. 1981; Nogueira et al. 1981) and sensitivity to complement is known to be different (Nogueira et al. 1975). The surface of the blood trypomastigote stage of T. cruzi is not, however, covered by an electron-dense protein coat of the type found in African trypanosomes such as Trypanosoma brucei, nor is there any evidence of antigenic variation during infection although antigenic differences between strains of T. cruzi have been detected (Nussenzweig and Goble 1966).